Most everyone in Edgefield County knows Thurmond Burnett of Edgefield Mercantile, but most do not know he has a car that he’s restored? Perhaps some may have seen him drive by in one of the local parades or at The Edgefield Cruise-In where he will have it on display again, July 18. 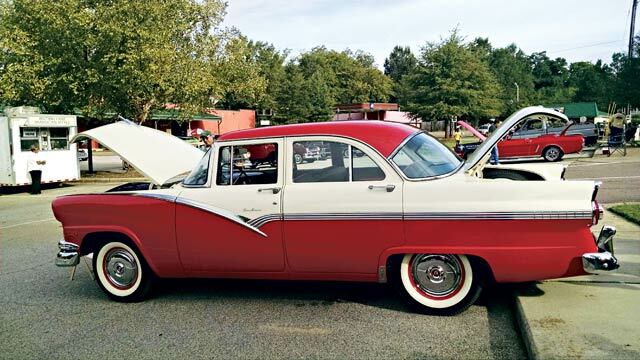 His car is a 1956 Ford Towne Sedan. He chose the car to restore because it reminded him of the car he had as a teenager while in high school. About 25 years ago he noticed this car parked in the yard of Miss Annie Mae Wise, sitting under an old oak tree. At one time he had business dealings with Miss Annie Mae and asked if she’d be interested in selling it. She said she’d suppose so and they made a deal. Thurmond kept it about 20 years allowing it to rust out before restoring the old car, as restoring a car isn’t cheap. The first thing he replaced was the hood. When he bought the car from Miss Annie Mae he learned that the car was parked under that tree because the hood flew open on her one day while she was driving and she got it home and parked it under that tree and left it. Thurmond inquired the help of Mac Winn from Plum Branch who did much of the legwork to find the various parts that had to be replaced, along with the help of Brothers Garage in Greenwood. Winn found the parts, and it took about a year and a half to finish the restoration project. Thurmond Burnett was born and raised in Edgefield and has been a prominent figure for decades as citizen and business owner of Edgefield Mercantile. He has been known to work hard and tirelessly. But this work ethic follows his employment history which begins when he was just a young boy. Thurmond’s first job was at Mitchell’s Drug Store, once located on Main Street in downtown Edgefield, when he was 11 years old, in May of 1949. Back then he was known as a “soda jerk” working behind the soda counter. He was so small at that time that he couldn’t reach the top of the Coca Cola dispenser so they had to turn it upside down, and even then he had to stand on a crate. After just one year, at age 12, he earned the right to hold a key to the shop and was responsible for opening at 7:00 a.m. He worked from 7 a.m. to 7 p.m., 75 hours a week for 4 years and earned $10.90 a WEEK. AND, he will tell you he felt rich earning that $10.90. In 1953, Thurmond went across the street and worked for Edgefield Paint and Electric. He lived with his family all this time 8 miles away from downtown and his places of employment. He got to work hitching rides (in time to be at work at 7 a.m.) by knowing who worked where in the area and being outside looking for a ride in time to get to work. His mama worked at a sewing factory in Johnston but she rode to work in a car where 6 women filled the seats. Occasionally he was allowed to hitch a ride with them but had to sit on someone’s lap. Thurmond lost his father during the time he worked for the drug store. When he began at Edgefield Mercantile and Furniture in 1953 they told him he needed to wear a proper dark suit and white shirt and a tie. Upon finding him without a suit and tie, Mr. Hammond sent him to Scavens, a men’s clothing shop in Edgefield and told them to “set suit him up.” When they asked him what kind of shoes he would like, Thurmond remember the wing tip shoes the men who would sit at the counter of the drug store having a coca cola wore and requested a pair of them. Bud Lowe who worked in the shoe shop in Edgefield at that time and said Thurmond walked backward for 2 days looking at his fancy wingtips. 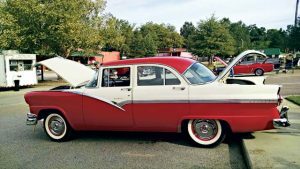 One can be sure to recognize him next time he’s out for an ice cream on a Sunday afternoon, but be sure to come see him at the Edgefield Cruise-In on July 18th when he’ll have it parked on the Square.